There are 66 Dateline models in the Hamilton lineup, starting in 1963 and going into the 1970s. Not all calendar models are Dateline models but most of them are. Of the 66 Dateline models, half are A-series models. Eight of the 33 A-models came in solid gold cases and of the those eight, one is the 1966 Dateline A-279. It was produced only in the 1966/67 timeframe. Priced at $175, it retailed at the equivalent of about $1,300 in today's dollars. Try finding a quality watch in a solid gold case at that price in a jewelry store today! Of course, gold was priced at $35 an ounce in 1966 - quite a bit different than today. Solid gold models tend to be less common than gold filled, which is understandable. Finding the eight Dateline A-2-somethings could take a while. I recently had someone send me an A-279 that they recently picked up. Looking closely at it, it appears that it has never been worn. 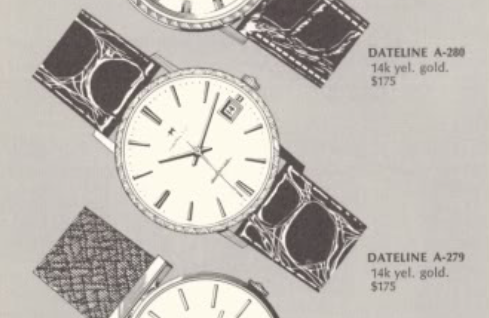 Some Datelines are in the Thin-o-matic T-series line and a good way to determine which line the watch is in is to see how deep the pie-pan back is. There are no marks whatsoever inside the case back so the odds are good this watch hasn't been opened in over 50 years. The Dateline A-series models are powered by the 17 jewel Hamilton 694A movement - or at least all of the models I've seen so far have that movement. It's basically a 689A movement but with a calendar complication added on the front. The partially reassembled movement is now ticking away with good motion. It's off to the timer to see how well it's running. Not too bad at all. The amplitude is a little low but I haven't fully wound the watch yet since there's no crown attached. On most watches I'd call it a day at this point but it's so easy to adjust the beat error I would feel guilty not lowering it even more. Just a minor tweak to the hairspring stud dials the beat error in to near-zero. I'll leave it running a smidgen fast for now, it will probably slow a little as everything settles in. Well, this watch looks pretty much the same as it did at the start. But now the owner can use it without concern about the watch running without oil. Even though the watch may not have been used in 50 years, the oil inside surely evaporated long ago and needed to be replace. Thanks Dan! Can't wait to get it back in my watch box. I was just rereading the article and I only wish I had sent you the original (unworn) strap, instructions and box for the photos. Still ticking away great!